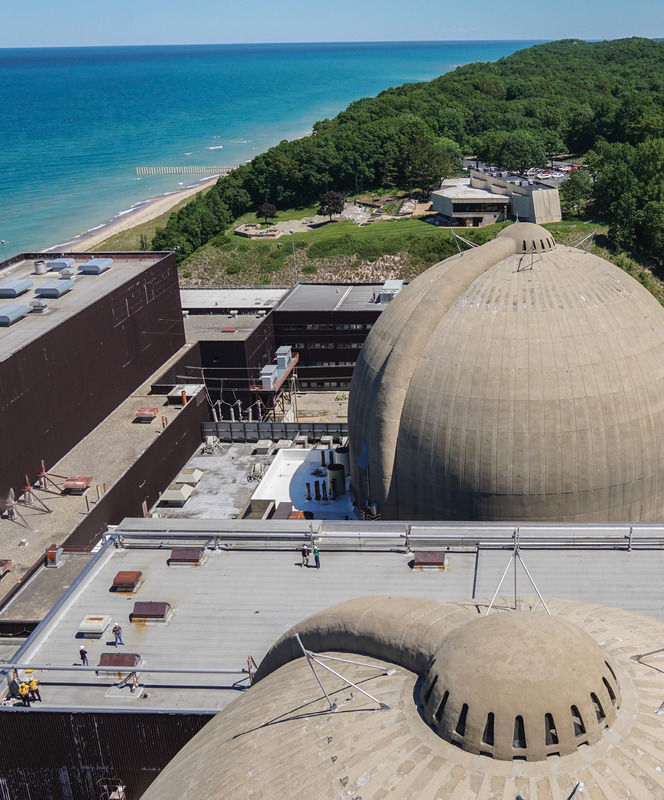 When an engineer first suggested using a drone to inspect two concrete pressurized water reactor (PWR) containment domes at American Electric Power’s Cook Nuclear Plant, David Aubrey, who oversees these inspections, was hesitant to trust such a new technology with such a critical task. The engineering program manager didn’t know much about unmanned aircraft systems (UAS) at the time, except for what he’d seen in the news. But after doing more research and learning about the cost savings and safety improvements these systems were bringing to other industrial areas, he changed his mind. The team spent about a year planning the inspection, and chose the U.K.-based Cyberhawk Innovations as their vendor. Cyberhawk pilots completed an inspection process that usually takes weeks in a matter of days, reducing risk to personnel and saving the facility a significant amount of money. These flights also marked the first time a drone performed an inspection to American Society of Mechanical Engineers (ASME) code, Section XI Code to be exact, at a U.S. nuclear facility—a huge step forward for UAS in this industry. 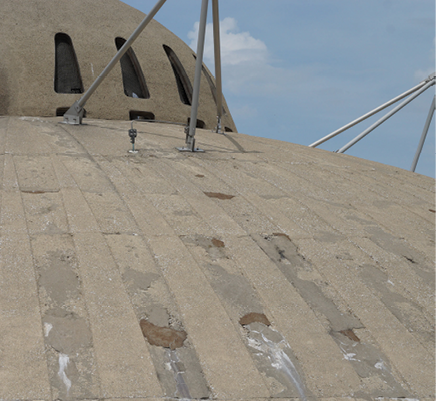 To meet code standards, the drone had to verify 100 percent coverage of the domes and satisfy specific visual requirements, Aubrey said. With a few modifications, Cyberhawk was able to achieve that, which has sparked even more interest in UAS in the nuclear community. Other nuclear facilities are adopting drones for a variety of uses both indoors and outdoors, including inspections and mapping. 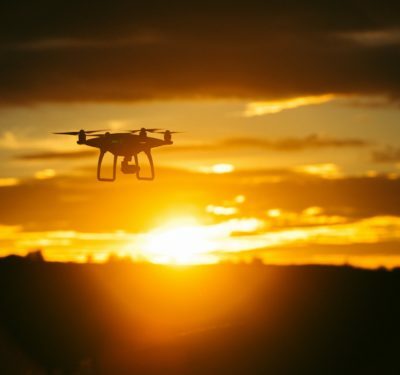 John Lindberg, program manager in the Electric Power Research Institute’s (EPRI) Nuclear Non-Destructive Evaluation Innovation Program, sees drones becoming a common tool in nuclear facilities in the next three to five years, with EPRI being part of the push to make that happen. The containment structures that needed inspecting are about 150 feet tall and 110 feet in diameter, which means a large crane must be brought in to lift personnel 180 feet in the air so they can get close enough to see any flaws, Aubrey said. It takes a week to set up the crane and a week to take it down, which is not only an expensive process, it’s also a safety issue. Workers have to build a large crane in an industrial area, with the high voltage tension lines coming off the plant in close proximity. The inspection, which must be completed every five years, is also weather dependent, Aubrey said. If it’s too windy, they can’t use the crane, and that means they’re disrupting normal facility operations even longer. Once Aubrey and his team decided to deploy a drone for their next inspection, they went to work to find a company that could operate in this environment and provide them with the detailed information they needed. Cyberhawk was given the safety code requirements, which were very specific as far as what had to be seen and what had to be measured, said Malcolm Connolly, Cyberhawk founder and technical director. From there, they had to come up with a plan to ensure they could validate the photos in terms of the resolution needed and see defects at the proper size. While the team had to develop software and incorporate hardware modifications to make this happen, they’d already been meeting similar inspection requirements in the wind industry and were able to adapt some of the already existing hardware for this mission. Cyberhawk was on site for six days, Connolly said, with the inspection taking about four. The other two days were spent working out security issues and checking the data collected. At the end of each day, engineers received a report so they could validate the coverage and determine if they needed to re-fly an area. They received a full report about two weeks after the flights were completed. Typically, engineers would only have a paper report to work with after these inspections, Connolly said, including drawings with each defect marked. Now they have a digital report that covers 100 percent of both domes. Of course, performing a drone inspection at a nuclear facility didn’t come without its challenges. The power plant was live, Connolly said, with two generators spitting a lot of electricity—so pilots had to deal with the magnetic fields. This caused a lot of interference with GPS, as did the high steam content in the domes. The rebar reinforcing the concrete had a high magnetic field as well. The interference meant the drone had to be flown manually most of the time, with pilots switching between using GPS and not using GPS. That’s more challenging, but the pilots were trained to handle the situation. It was also difficult to operate in the noisy, congested environment, and to get the UAS to fly in small spaces. Still, even with the challenges, the system proved its worth in terms of safety alone. Ontario Power Generation (OPG) performed its first drone inspection in 2015, which was a proof of concept of a vacuum building at one of the company’s nuclear facilities, said Tim Trebilcock, scientist/technical officer, UAV Operations, and one of the drone program founders. This first inspection kicked off that program, which now encompasses a fleet of 18 UAS. It also led to the creation of OPG’s Technology Innovation Group. The team has four qualified pilots who fly drones at various facilities to complete various tasks, said Vinay Kirpalaney, section manager, Technology, Innovation and UAVs. The group includes a development lab, where they examine new tools and determine how researchers can help solve problems throughout the organization. The group has completed several missions using its drone fleet, which includes both the Albris and the eBee with RTK from senseFly, the SkyRanger from Aeryon Labs and the Elios from Flyability. They’ve mapped facilities to help meet security requirements, they’ve completed work assessments and structural inspections, flown hangar equipment to locate ID tags in hard-to-reach areas, monitored construction sites, gathered information from and images of a meteorological tower, and completed the first inspection of a hydroelectric station in Niagara Falls, generating a large 3-D model point cloud. Early last year, OPG partnered with the New York Power Authority (NYPA) to inspect the ice boom between Lake Erie and the Niagara River. This series of floating steel pontoons, which are connected by steel cables, is installed at the Niagara River mouth to limit the amount of ice that enters the river. This ice can build up at the hydroelectric water intakes that effect the hydropower stations that both companies operate. The ice boom experienced a break, a situation that normally requires workers to make two trips on the water: one to determine what the problem is and another to complete the repair, Trebilcock said. With the SkyRanger, they were able to quickly inspect the boom, locate the break and determine how to fix it. 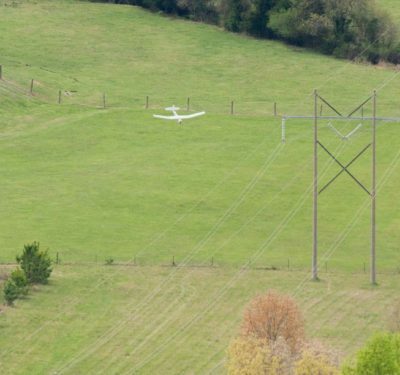 Rather than relying on a drone company or service provider to perform the flights, OPG decided to train their employees to fly the systems, Trebilcock said. OPG has a rigid safety culture and highly skilled technicians, and it just made sense to broaden their skillset rather than bring in outside pilots. Trebilcock has worked closely with the pilots over the last few years to safely and effectively implement drones into operations. They’ve also invested in a variety of drones for the many different missions they fly. The SkyRanger does well in adverse weather conditions, has great optics and is tablet driven. They purchased the eBee RTK for its mapping capability and the Albris for its ability to look up and down with its camera. The DJI Maverick is well suited for indoor inspections, and the Elios can fit into confined spaces and difficult-to-reach areas inside the facilities. The program has come a long way in the last few years, and the team intends to keep looking for new, innovative ways drones can reduce safety hazards and save time and money. A U.S. based power plant used the Flyability Elios, a collision tolerant drone, to check a valve that was leaking in a radioactive area, said Marc Gandillon, Flyability’s head of marketing. Before investing in the Elios, they sent people into radioactive areas when they needed to identify a leak, Gandillon said. To do that, they had to make the area human accessible first, which means lowering the level of radioactivity in the environment by turning down the power plant—a process that takes half a shift to complete. Once that’s done, workers could then go into the area with the necessary equipment, but only for a short amount of time, depending on the levels of radioactivity. If they can’t find the source of the leak, which can be difficult to spot in that limited timespan, a second team would have to go in. After the leak is identified and fixed, the plant can go back up to full power, which takes another six hours. Before they could bring the Elios in, the facility had to go through a substantial risk assessment to make sure the system was safe, and didn’t have the potential to create other problems, Gandillon said. For example, there are pipes buried in the ground to pump radioactive water. If a drone were to fall on and damage a pipe, it could lead to major problems. Because the Elios is surrounded by a cage, that wasn’t a concern. Robert Carnaroli, who has worked with the Elios at an Exelon nuclear plant, was initially interested in using it to detect steam and water leaks. There is now an Elios in each of the company’s facilities, and employees are encouraged to think of new, safe ways to use the system. One wanted to check the type of sprinkler heads installed up high in a room, and others have asked about using it to inspect inside of pipes. Some facilities are also looking at the Elios to monitor hazardous material storage, Gandillon said. These materials are stored in large spaces and facilities need to know how the containers are evolving over time. Deploying drones would provide that information while reducing human exposure. EPRI has two groups working on finding ways drones can be incorporated into nuclear facilities; one focuses on outside areas while the other is concentrating on deploying drones indoors, Lindberg said. They’re also working with research partners to find ways to modify existing commercial drones to fit the industry’s specific needs. So far, they’ve investigated flying drones to inspect containment structures, which is typically done manually via scaffolding or repelling down the side of the structure. The team completed a trial inspection of a containment structure last November at a Southern Company plant using systems from Hazon Solutions and Charlotte UAV. The inspection, which included looking for cracks and other flaws in the concrete, took about three hours, with the team able to verify that the information collected by the drone’s camera had equivalent resolution as what would have been seen by the naked eye. This was EPRI’s first demonstration, and Lindberg said they took away valuable lessons, including how important communication is to a successful mission. 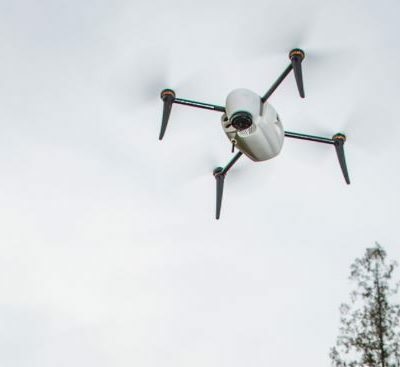 The team sees the benefit of using drones to inspect other structures, such as dry cask fuel storage, Lindberg said, and is looking into other areas as well, such as security patrols. Plant security performs walk downs, walking or driving around specific areas of the facility to make sure everything is as it should be. 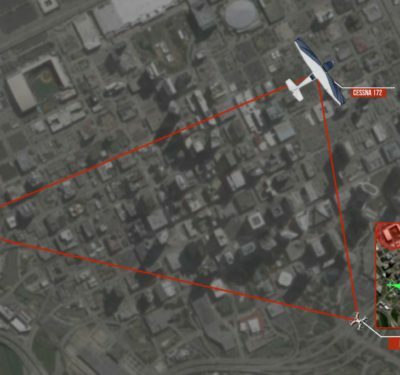 UAS could perform these perimeter scans instead to collect data that would be analyzed by the drone itself or security personnel back in the control room. If there was a security intrusion, the drone could be sent to investigate, giving security a better idea of what they’re dealing with before they respond. Accident investigation is another area where drones could prove beneficial, said Stephen Lopez, senior technical leader in EPRI’s Nuclear Instrumentation & Control Program. A drone would be pre-positioned in the plant, either close to containment or in containment, and deployed during incidents that make an area uninhabitable or dangerous for humans. They do have a prototype designed for this application, but they need a system that could operate in hazardous conditions, which is among the challenges to deploying drones inside these facilities. GPS is another, Lopez said. While there are already a variety of applications leaders at nuclear facilities are entrusting to drones, they’re also focused on what this technology can do in the future. Being able to measure radiation, for example, would help facilities minimize exposure and to better plan maintenance, Gandillon said. Trebilcock sees drones monitoring a facility that will stop producing power in 2024, performing inspections during long-term storage and generating reports. There are many other valuable possibilities. While they primarily need cameras for the visual inspections that are performed today, the team at EPRI is also looking at infrared cameras and hyperspectral imaging for more specific applications, Lopez said. Environmental sensors that collect information like temperature and radiation levels would also be beneficial, as would microphones—basically anything that can be used to monitor an environment or an area around a piece of equipment. As this risk-averse industry begins to trust UAS technology, they’ll find more ways to deploy drones to cut costs, save time, increase safety and minimize radiation exposure.